As you might recall, the Warleggans were on an evil mission to take down Carnmore. They were finally able to discover the name of one of the secret shareholders: MR. TRESSIDER. So George pays him a visit and politely threatens to withdraw his loans unless he severs his relationship with the smelting company. Basically, George was harassing, creating artificial monopolies and probably about to benefit from insider trading… and no-one is the wiser. Man, it was much easier to be a white collar criminal back in the day! [corporate espionage was also easier, instead of hacking you just had to follow people around]. Nevertheless – in a shocking turn of events – George does something other than ruin lives. He decides to mix it up a bit and help someone. The lucky recipients of his benevolence are Francis and Elizabeth [emphasis on Elizabeth]. George offers them money to make up for the assets his cousin Matthew Swanson took playing cheating on cards. Elizabeth and Francis are obviously overjoyed. I am not sure what George’s agenda was here. Was he actually concerned about righting a wrong? I doubt it. Was he paving the way for his later scheme… or was he just trying to impress Elizabeth [with whom he appears to be in love]. Maybe all of the above. In the meantime, Demelza has been acting as a carrier pigeon for Verity and Captain Blamey. They have continued their love affair and, finally, Verity decides to elope with him. Francis concludes that it was Ross’s doing because… well because Francis loves to blame Ross for everything that is wrong in his life [and the world]. George picks this precise moment for another visit to Trenwith and his stay quickly turns into a “Let’s hate Ross” party. George takes advantage of Francis’s enraged state and manipulates him until he willingly names all the Carnmore shareholders. That was a very literal way to “break” a marriage. Verity is not the only woman involved in a scandal, FLIRTY KEREN is giving people something to talk about too. Word of her wandering eyes reaches Mark and he starts to question his wife’s loyalty. Mark’s jealousy is completely justified because Keren has been throwing herself at Dr. Dwight for quite some time [since 2 minutes after she married Mark to be precise]. Dwight was trying to do the right thing for a while, but her advances are finally so aggressive that he can’t reject her any longer. Mark finds out about the affair and confronts Keren. They argue and in a moment of rage Mark kills Keren by accident. When Ross learns about Mark’s actions, he is determined to help him. Ross still feels guilty about what happened to Jim Carter and he doesn’t want another one of his employees to perish in prison [although - in all fairness - poaching not as bad as killing your wife]. So he decides to help Mark escape, almost getting arrested himself in the process. The day after, Carnmore shareholders call an extraordinary meeting. Turns out that the Warleggans recalled all of their loans. So not only they are not in a position to invest… they are all about to be bankrupt. 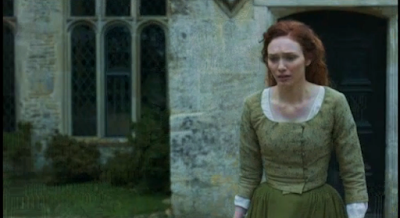 When Ross returns home, Demelza confesses that she was the one who helped Verity. Ross doesn’t take the news well at all. Demelza doesn’t understand what she did wrong. She only wanted to help two people who loved each. OK… so I get it. Her actions had consequences, but she had good intentions! Plus I’d argue that Francis colluding with George was more about their general jealousy and dislike for Ross than whatever happened with Verity. I think even if Demelza had nothing to do with it, Francis would have still assumed Ross did… so it is unfair to put all the blame on her. It is more about Ross “doing what he wants” and “saying what he thinks” [which I love about him, but Francis and George don’t]. OK… so I get it. Her actions had consequences, but she had good intentions! Why do people think that good intentions excuse everything?